The warning will be valid from tomorrow at 6am until Saturday at 6pm. 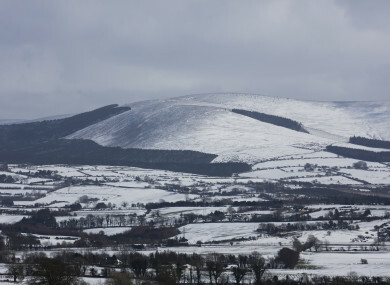 Snow on the Wicklow Mountains in March 2018. A STATUS YELLOW snow and ice warning has been issued for Ireland, as temperatures are set to dip to minus five degrees Celsius on Wednesday night. Met Éireann has said this week will be very cold with scattered wintry showers, which will be frequent across the southwest, west and north. Some accumulations of snow are expected, and the forecaster has said there will be widespread frost at night with icy stretches on untreated surfaces. The warning added that there is a possibility of a more significant spell of sleet and snow on Thursday. Looking at the forecast for the week, this morning much of east Leinster and Ulster will be dry with frost and icy patches, which will gradually clear later, Met Éireann has said. There will be patchy rain or drizzle in the west and south, and showers will spread from the west this afternoon. It will be cold with highest temperatures of four to eight degrees. Many areas will be dry early tonight with clear spells, and with and icy patches forming quickly as temperatures fall to between minus one and plus two degrees. Scattered showers in the west and north will turn to more persistent rain closer to midnight and then cross the country overnight, turning wintry in places. Tomorrow will be very cold. In the morning, rain and sleet will clear eastwards with sunshine and wintry showers following for the rest of the day. Some of the showers will be of snow, especially in Connacht and Ulster and on high ground. Highest temperatures of two to seven degrees with gusty west to northwest winds. On Monday night scattered showers will become confined to Atlantic coastal counties. However, a spell of rain will affect the west and southwest later and become widespread by morning, turning wintry with the risk of some accumulations on higher ground. Lowest temperatures will be around minus one to plus two degrees with widespread frost. Tuesday will be very cold with outbreaks of rain, sleet and snow which will later clear to scattered wintry showers and some sunny spells. Top temperatures will reach just two to six degrees. Tuesday night will be very cold with scattered wintry showers and clear spells. Lowest temperatures will fall to between zero and minus three degrees with a widespread hard frost. Wednesday will continue cold with scattered wintry showers becoming isolated, and mostly dry later with good sunny spells. Top temperatures will be around three to seven degrees. Wednesday night will be dry with good clear spells at first but it will turn very cold with lowest temperatures falling to minus one to minus five degrees with a severe frost. However, cloud will increase from the southwest with a spell of persistent rain affecting the west and southwest by dawn. On Thursday a spell of rain, sleet and snow will gradually clear northward to scattered wintry showers. It’s expected to stay rather cold with afternoon temperatures of just one to seven degrees. Email “Snow and icy conditions expected as nationwide Status Yellow warning issued”. Feedback on “Snow and icy conditions expected as nationwide Status Yellow warning issued”.